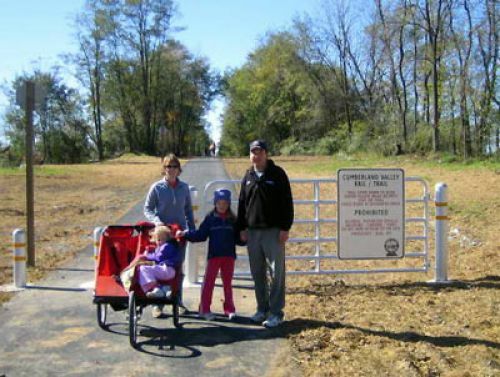 Rail trail follows the old Cumberland Valley Railroad rail corridor for 9.5 miles, from Shippensburg to Newville, through the rich, rolling, picturesque farmlands of south-central Pennsylvania. Location: From Shippensburg, PA, to Newville, PA, for approximately 9.5 miles along the old Cumberland Valley Railroad corridor, connects Shippensburg north of State Route 533 to Newville. Southern terminus (Shippensburg Township Park) from I-81 southbound: Exit I-81 at Shippensburg (exit 29). Right on Walnut Bottom Rd. Left on King St. (US 11). Right on N. Queen St. Right on Britton Rd. (approximately 1/2 mile to the park). Southern terminus (Shippensburg Township Park) from I-81 northbound: Exit I-81 at Shippensburg (Exit 24). Left onto Olde Scotland Rd. Left on Fayette St. Right on King St. (US 11). Left on N. Queen St. Right on Britton Rd. (approximately ½ mile to the park). Northern terminus (Newville) from I-81: Exit I-81 at Newville (Exit 37, PA 233 north). As you enter town, take the first left on Vine St. and follow through town becoming Fairfield St. (PA 533W). As you leave town, turn left on Cherry St. and go to street end at McFarland St.
Northern terminus (Newville) from Carlisle, PA: Take PA 641 through Newville. Left on Cemetery Rd. and follow to end of the road on McFarland St. The majority of the trail's ten-foot-wide walking-biking path consists of well-packed, crushed limestone. The trail becomes macadam at the eight secondary road crossings which are all level, at-grade, and well marked with safe (perpendicular) crossing angles. The trail is wheel-chair accessible and all road crossings have been designed to meet ADA specifications. A grassy bridal path parallels the pedestrian path the entire route of the trail. Ample parking, restroom facilities, and picnic areas are located in Shippensburg Township Park at the CVRT's western terminus and in Newville Borough at the CVRT's eastern terminus. A midpoint trailhead with a parking lot and shaded picnic area is located in the village of Oakville. There are also several park benches located strategically along the route where trail users can rest. The corridor for the CVRT was donated to Cumberland Valley Rails-to-Trails Council (CVRTC) by Conrail in 1995. The CVRTC spent the next 11 years developing the corridor into a multi-use trail to serve all ages and abilities. The first 4.5 miles of trail were completed in the fall of 2004 and the next five miles were finished in the fall of 2006. Near-term plans include extending the usable trail corridor from 9.5 to 11 miles by improving the first mile of the trail in Shippensburg and the last half-mile of trail at Newville. The longer-term vision includes an 11-mile extension of the trail east along the old CVRR corridor from Newville to Carlisle. When that work is complete, the CVRT will run 22 continuous miles from Shippensburg to Carlisle. The CVRT is managed and maintained by the Cumberland Valley Rails-to-Trail Council (CVRTC). The CVRTC is an all-volunteer, non-profit, 501(c)(3) charitable corporation dedicated to conservation, historic preservation, recreation, and alternative transportation through the development of multi-use trails along former railroad corridors and other areas.